It’s the middle of football season! I didn’t talk about it last year, but football is my favorite sport. Back in the day I would play small games with my nephews but nowadays I just watch my favorite team. I’m from New England so I know you’re thinking I’m going to say the Patriots. You’d be wrong ;) My favorite team is actually the Baltimore Ravens! We’re not doing so hot this year, but we’re not the Browns so there’s that! I haven’t always been into football. I used to not really care and only watched the Super Bowl for the commercials. Now, I couldn’t care less about the commercials because they’re not as good as they used to be. Halftime is fun too, unless it’s Beyoncé. For 2017 I guess we’re getting Gaga, which could go either way for me. I fell in love with football during Super Bowl XLVII (Super Bowl 47, 2012 season but the Bowl was held in 2013) when the Ravens played an incredible game. That was the same year I fell in love with my team. And I know I’m a real fan, because even though we haven’t done as well as we could, I still root for my team every time we play. My favorite player was Brendan Ayanbadejo, and of course he left the team that same year. Now I don’t have a favorite player, but I’m proud as hell of my quarterback, Joe Flacco. I do like Steve Smith Sr and Terrell Suggs because they’re badass. And our kicker, Justin Tucker, has never missed. I don’t hate the Patriots; they’re actually my second favorite team. I’ll watch their games when it doesn’t interfere with my team. Amanda loves the Patriots. She thinks #InflateGate was ridiculous. She loves Gronk, and thinks Brady is the best quarterback in the league. I won’t lie, Gronkowski is a great player and I like Malcolm Butler and Julian Edelman too. In fact, I think MVP should have gone to Butler last year (as in 2015) but of course it went to Brady. My brother played football in high school, which is another reason I like it. I also have to give a shout out to wrestling. My nephew, Mishka, is obsessed with it. 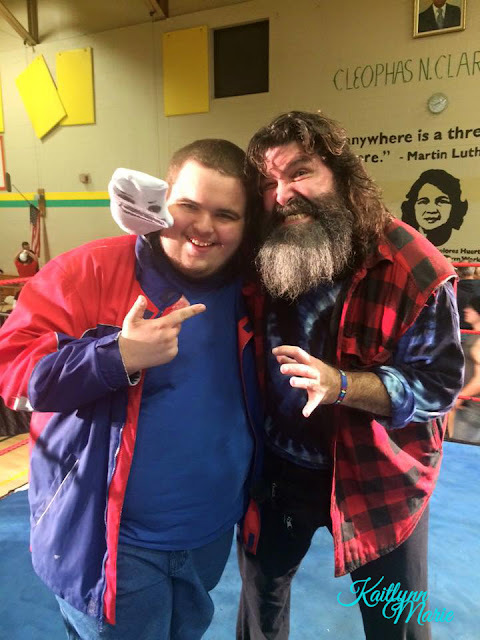 I've taken him to a few indy shows, including one this past Sunday. 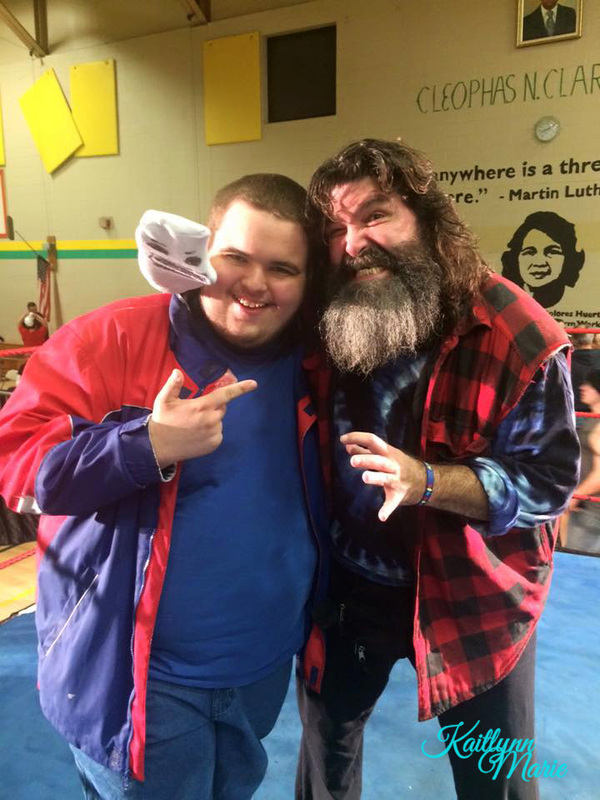 He's met Mick Foley, I've met Matt Hardy and a few others. Not to mention some of the indy guys at the small shows we've gone to. I've seen WWE shows at the Sun, but we were pretty much always up in the nosebleeds. I enjoy watching local racing at the Waterford Speedbowl too. I’ve never really been a fan of Nascar. I prefer being there in person. 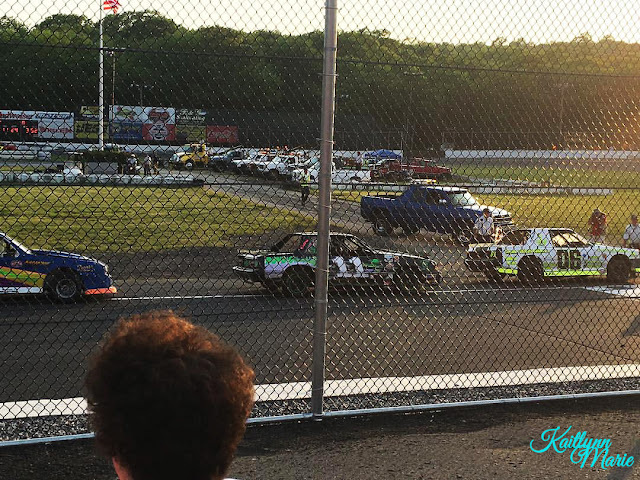 My dad drove at the Speedbowl before I was born and I’ve been going to the track since I was a month old. My nephew and I went a few times this year and plan to keep the tradition going. Going to the track is more personal for me, because I have family and friends that race. I used to play basketball and soccer in school, and they were enjoyable enough. 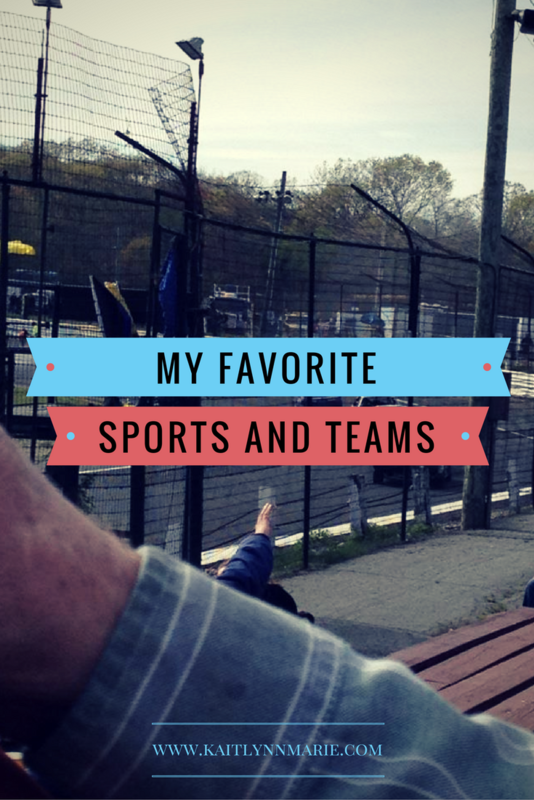 I don’t have cable and I don’t pay enough attention to other sports to call anything but football a favorite. And the Ravens are my team, regardless of their scores. As long as we always beat the Browns, I’m good! I don't have any pictures of football games because I've never been to one in person. 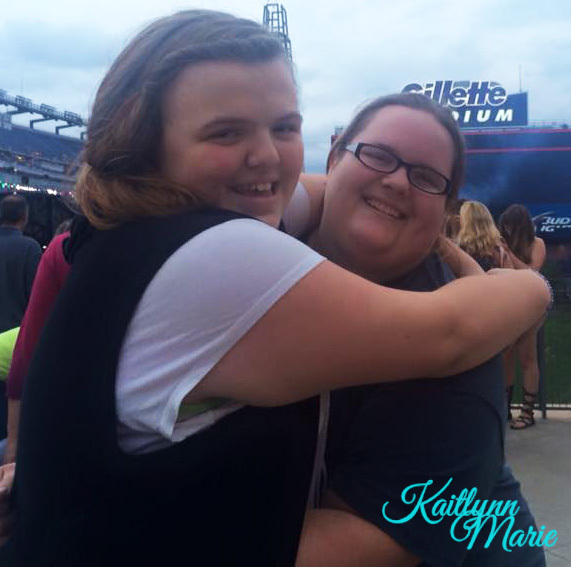 I've only got this one picture of Bug and I at Gillette Stadium for the One Direction concert last year. Do you like football? 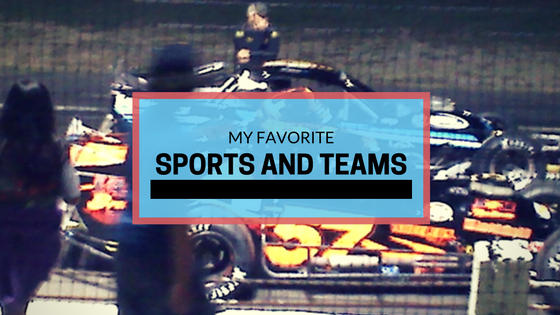 Do you have a favorite team? 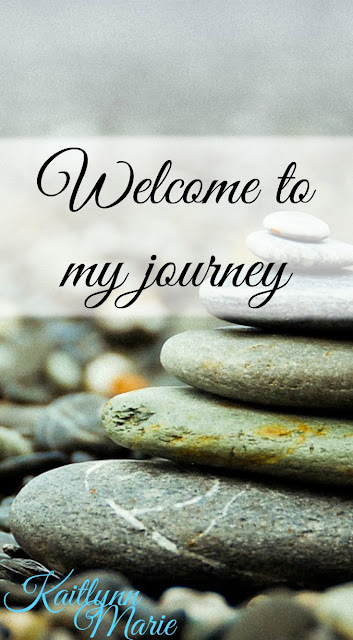 Let’s chat!